Indian developer Dilip Barot is back. A decade after pulling the plug on an oceanfront condo project on Palm Beach’s Singer Island, Barot is resurrecting the development. 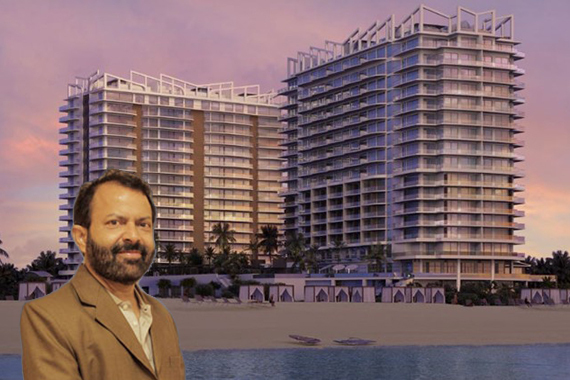 During the last condo bust, Barot returned 86 deposits to buyers of his proposed Amrit Ocean Resort & Residences. He held onto the 4.7-acre site at 3100 North Ocean Drive and the property has remained vacant since then. Now, Barot has an on-site sales center for the new project, a 19-story tower and an 18-story tower called Peace and Happiness, according to the Palm Beach Post. It will have a mix of hotel rooms, managed by Crescent Hotels & Resorts, and condos with prices ranging from the $700,000s to more than $4 million for penthouses. Premier Sales Group is handling marketing of the 351 units. The wellness-oriented Singer Island project will have a spa and wellness facility, a beachfront garden, an oceanfront demo kitchen and a gym. He also plans to have on-site “health assistants” for residents, according to the Post. But some may be skeptical. Over the years, Barot was sued at least three times: by his architect for nearly $800,000, by Regions Bank for defaulting on a $3 million loan, and by Nationwide Life and Annuity Insurance Co. for alleged fraud and more.